Since 2001, the first full week of August has been dedicated to National Stop on Red Week. This year, National Stop on Red Week is August 2-8. The purpose of this week is to promote safe driving practices, which include always stopping at a red light. Red light running is a pretty big issue across the United States. 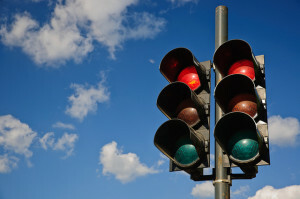 In fact, red light running is the leading cause of urban car accidents. It may be surprising, but one out of every three people knows someone who was killed in a red light collision. Red light crashes are responsible for around 900 deaths and 165,000 injuries each year. Red light accidents resulted in 697 fatalities. Nearly half of the people killed were pedestrians, bicyclists, and motorists other than the one who ran the red light. Another 127,000 people were injured in red light accidents. Failing to stop for a red light, stop sign, or all other forms of traffic control is the most common type of crash in urban areas. Always stop when the light is red, no matter what. If you plan to turn right at an intersection where right turns are permitted at red lights, always stop and check for cars and pedestrians before making the turn. If the light turns yellow while you are approaching an intersection, slow down and stop. Do not try and speed through the intersection in order to beat the red light. The Florida Auto Accident Injury Lawyers at Whittel & Melton help hold careless and negligent drivers accountable for their actions. If you or someone you love has been injured or killed in a red light traffic accident, please call us today at 866-608-5529 or contact us online for a free consultation so that you can learn what important steps to take next.